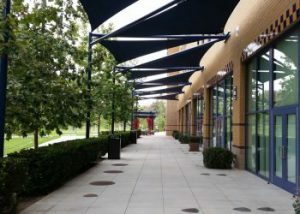 Whether waiting for public transportation or walking from the parking garage, no one enjoys getting soaked by the rain or sweltering in the sun – but it’s not always possible to incorporate protected entryways, walkways, and waiting areas into a property’s design. Or is it? Tensile fabric structures are versatile and cost-effective solutions for adding more comfort, functionality, and aesthetic appeal to your commercial property. 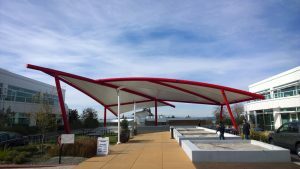 Here are just some of the benefits of using tensile fabric structures to overcome your weather-related challenges. Perfect for pedestrian bridges and extended walkways. Unlike traditional construction options, tensile fabric structures are able to span greater distances with less support. While this can translate into valuable cost savings, it can also be an invaluable benefit because it creates solutions for projects that wouldn’t be able to accommodate a covering otherwise – due to weight restrictions, design requirements, or an endless list of other special circumstances. Perfect for outdoor shopping malls and corporate campuses. Branding may mean graphic printing on a membrane or it could simply mean designing with brand-consistent colors. Regardless, tensile fabric structures can help to create a brand experience for visitors to your property. 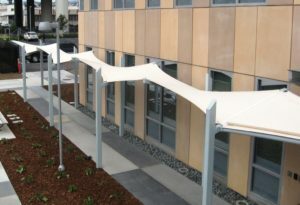 Consider the possibilities for your building’s entryway or the covered walkways throughout your property. Perfect for hospitals and office buildings. Tensioned membranes are an attractive solution for many designers and architects because of its translucent nature. Property users can be protected from the elements while still enjoying the brightness of diffused natural light – saving you money on energy and creating a comfortable user-experience for your customers. This can be a well-balanced solution when looking to cover walkways without blocking all of the sunlight for lower rows of windows. Perfect for public transportation centers, valet areas, and offices with ride-share initiatives. If there’s an outdoor waiting area on your property, you know how uncomfortable people get when the weather becomes extreme. 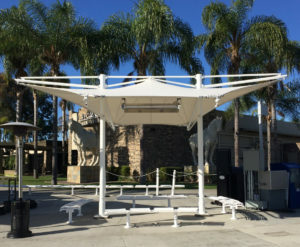 Tensile fabric structures can give you even more control over the climate than simply blocking precipitation and creating shade. Infrared heaters can keep guests warm in the winter and/or overhead fans can keep them cool in the summer. Are Tensile Fabric Structures Right for Your Next Project?